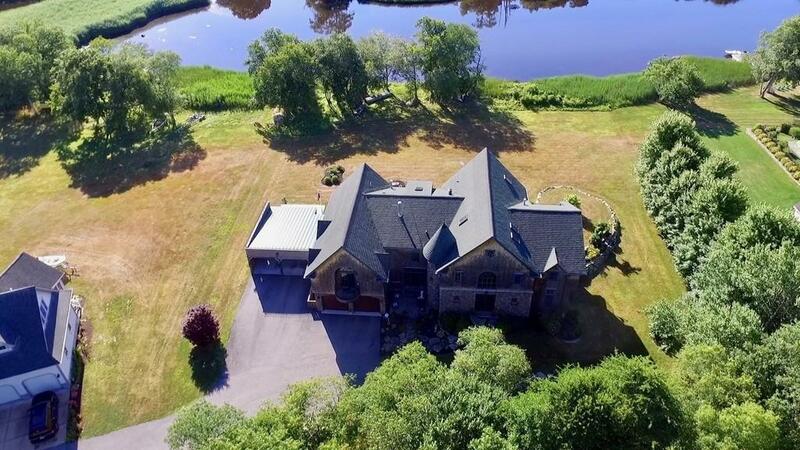 If your home is your Castle, this is a must see, alongside the east branch of the Westport River. This spectacular home is built in a classic Newport cottage style. Rustic elegance throughout the main house and a fully appointed 2nd floor In-law apartment, with interior access, reflects style and quality of craftsmanship throughout. Architectural details include floor to ceiling windows, imported tiles, pine paneling & 2 fieldstone fireplaces, one in the main house and another in the apartment. Most rooms offer fabulous views of the river. The kitchen features many upgrades for your cooking pleasure and opens to a seating area and family room with a wood stove, making this the day to day heart of the home. Open floor plan from kitchen to dining and living rooms. 1st floor also has an elegant billiards room, office, and sunroom, The exposed beams and soaring ceiling height create a majestic feel. The grand staircase leads to an amazing balcony looking out to the river and below.